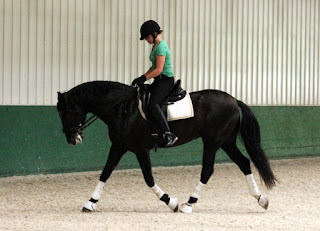 Confessions of a Dressage Barbie: Can I Ride Your Horse? After nearly 3 straight days of rain last weekend and isolated storms almost every day this week (and the accompanying humidity), so not much interesting going on with the riding side of things. Ruby had yesterday off and a light lunge tonight. 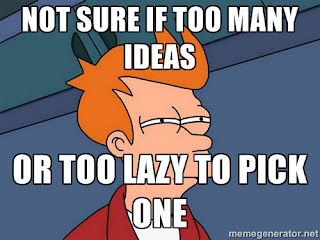 On the plus side, that’s given me some time to search out new equestrian blogs to follow, and keep working on my list of topics I want to write about eventually -- “eventually” being a nebulous term that could mean tomorrow or could mean in two years, if I manage to stick with this. I have a notebook I'm jotting ideas in so when I have no riding/training content, at least I'll have fallback topics! I’m kind of excited to have successfully passed the two month mark, with close to 4K views, which is way more than I managed last time I started (and then quit) blogging. So far I’m mostly recapping my mundane life, and not asking enough questions! 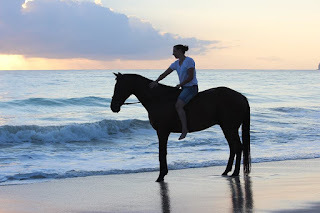 So I’m going to try to be better about writing posts with more questions, because I honestly am curious to learn all about how my horsey life differs from the horsey lives of a lot of the bloggers I follow (or the horsey lives of my friends!). 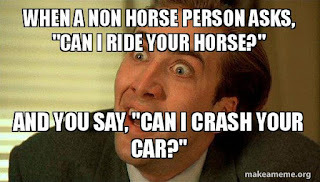 So here’s a fun topic that was suggested to me and the more I thought about it the more I realized that this is probably a widespread problem -- what do you say when non-horsey friends, acquaintances, or even total strangers ask if they can ride your horse? I’m not talking about a barn buddy asking to swap rides just to see how each other’s horses feel, or even someone you know who rides, I’m talking about those people who you KNOW are not horse people who think that just because you have horses you are running some sort of pony ride service? 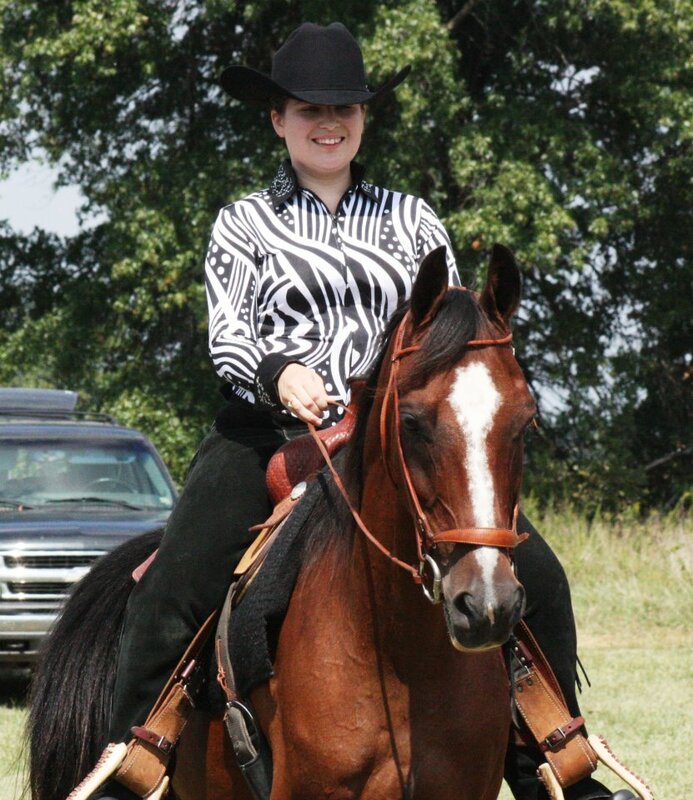 My BFFL is a great rider and can always ride my horses. 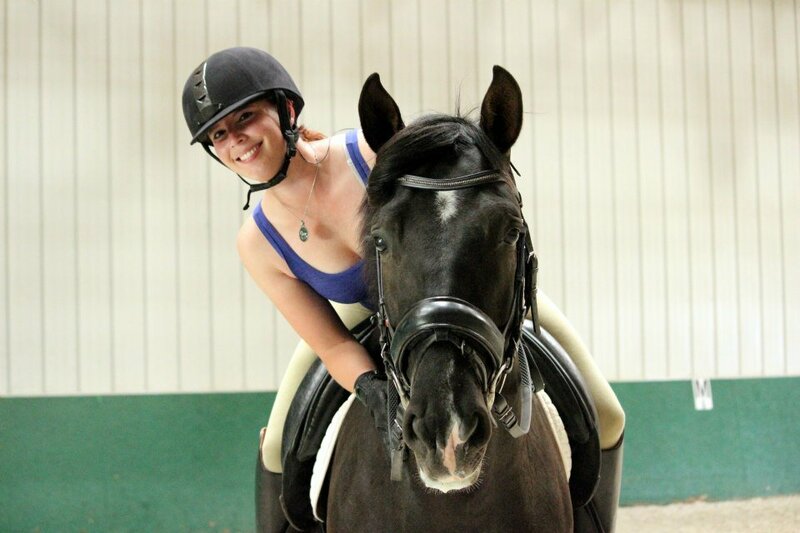 For a long time it was easy for me to duck out on this question, because I had very “hot” (and usually also green) horses, so I would just say “Oh I don’t have anything suitable for beginners” or “I’m the only one who can ride her/him, s/he’s not very trained”. 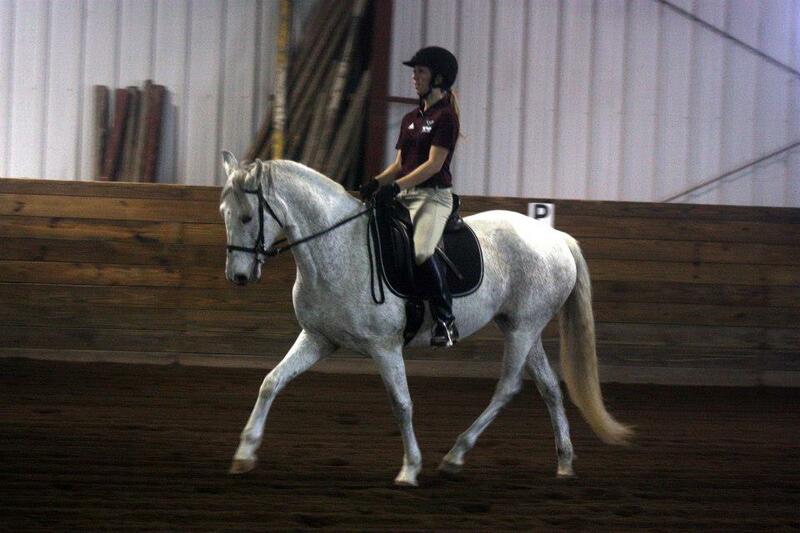 Our farm's former working student showing Tres a few years back. But now that DH’s horse Trigger is home again, that’s not really the case, as he is the definition of a packer. And obviously it depends on my relationship with the person -- if it’s a total stranger the answer is a blanket “No”, no further explanation necessary (No is a complete sentence!). But sometimes it gets trickier if it’s someone I have more than a passing acquaintance with. Best pony ride horse ever. Sometimes I will saddle up Trigger and do the pony ride thing (especially since we have an arena now, which makes me happier than just leading people around in the grass). Sometimes I duck out by using the insurance excuse -- it’s a liability, and my insurance doesn’t cover that. 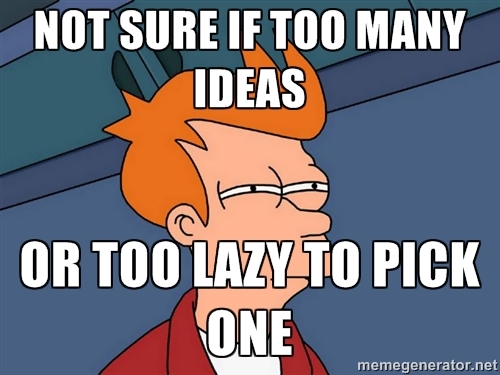 HorseNation had an article with excuses ranging from useful to just plain funny (number 7 was my personal favorite!). No beach riding if a friend of my mom (who didn't know me from Adam) hadn't let me ride her horse. But then on the flip side, I feel guilty. I didn’t have horses growing up, so if it wasn’t for the charity of horse-owning friends, I wouldn’t ever have gotten to ride. Sometimes this makes me feel like I should “pay it forward” so to speak, and help keep enabling the next generation of horse crazy kids who will hopefully fall in love with the equestrian experience like I have. Classic, an Arabian a friend used to let me ride when I was in high school. What do you tell people if they ask to ride your horse? Do you have a blanket response, or do you go on a case-by-case basis? My friend's PRE stallion who she graciously let me ride (and take lessons on!) when I visited her in Chicago. I would play the he isn't safe card for beginners. And if I don't like the way an experienced person rode it would be a flat no (my horse is more important to me than their feelings as harsh as that sounds). I would let certain people ride him with me watching but it is a limited list. Oh yes, that was something I missed in my post -- even if it's an experienced person, If I don't like the way they ride, no way are they getting on my horse. Good call! Most people don't ask to ride Courage. :-p Can't imagine why. I have occasionally let other people get on him, but he's not the easiest to deal with and no one needs to get hurt. So most often when people ask, I say he's a wild racehorse. I think for a horse like Courage, protecting his emotional/mental health is the most important things, no matter what. At least that's the sense I get from reading your blog. ha! great post! 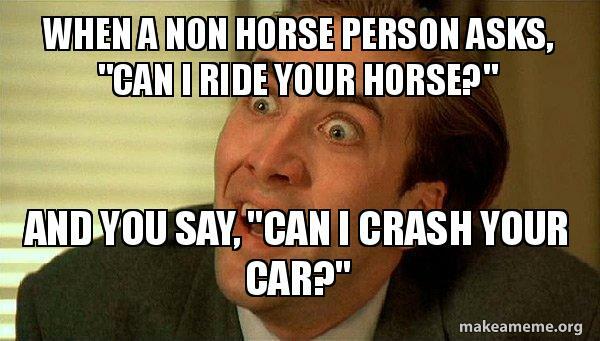 I get this ALL the time at work...but I'm scared to let someone ride. They'd probably be fine on my pony...I have the horse that everyone wants to ride because she looks like a packer, but she's still green in some ways, so definite no for kids. That being said, I am a novice and no one wants me to ride their horse, although I am pretty sure I can stay out of the way of a touchy horse, it just is what it is I guess. The problem with this is that I don't get much of a chance to experience and learn more from different types. I can always look for lessons though! I stand by your right to refuse for any reason! Nothing wrong with being a novice, we're all learning! That being said, come over any evening and take Trigger for a spin while I work the demon baby horse ;) if you have a yen to get on a different horse that is! It's easy to get so used to riding one horse that we get in a rut -- that's how I got with Topaz and then getting on Ruby made me feel like a complete beginner all over again! i don't own my horse so it's basically not my place to let other people ride her (tho i've had a couple rider friends on her, and a trainer ride... but who's counting?). I tend to avoid by changing the subject. Otherwise I just say that it's not safe. Both totally legitimate responses! Glad to know I'm not the only one who uses avoidance as my first reaction. Of course, only Charlotte or Carl or Steffen would be permitted to ride Izzy because he might kill someone, but Speedy would dig it. Unfortunately, I don't know very many people with kids, and even if I did, I have also probably scared most people away with my tales of disaster (numerous ER visits and such). My friends also know that I have horse in competition which they have managed to correctly interpret to mean that they are VALUABLE and not regular riding horses. They aren't necessarily valuable by banking standards, but just the amount of training time invested in them makes them worth more than the average nag. I find your observation that people sometimes equate competition horses as somehow being more valuable very interesting -- I got a lot more requests to ride my horse at my previous job (where I just had a few framed snapshots of my horses at liberty displayed in my cubicle) as opposed to now (where my office walls are liberally plastered with photos from horse shows and I have a ribbon border hung on 3 of 4 walls). And honestly I don't get that many requests anymore, but a good friend of mine has a small herd of ponies and is constantly being inundated with people inviting themselves (or usually their children/grandchildren) to go riding -- to the point of being quite pushy about it! Thanks for pointing out that it was YOUR post, no Sprinkler Bandits. 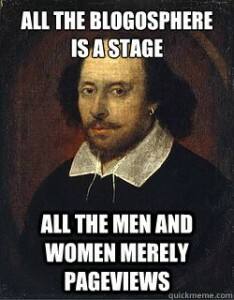 I like to give credit where do. While the young lady in question didn't ask for a ride, I was happy to offer. But back to the value of horses, it does seem that people are more reluctant to ask when they know the horse is in competition. I think it also intimidates them. If the horse is in competition, it must be scary/fancy/too hot to handle. I'll put anyone on Rico, I tend to try to not torment him, so only close friends/family have been allowed on him. I've only really had to say "no way absolutely not" to a few people who I just didn't trust. I didn't care to give them a reason. With my young horse, at this point he's on rehab so it's just me and my trainer riding him. 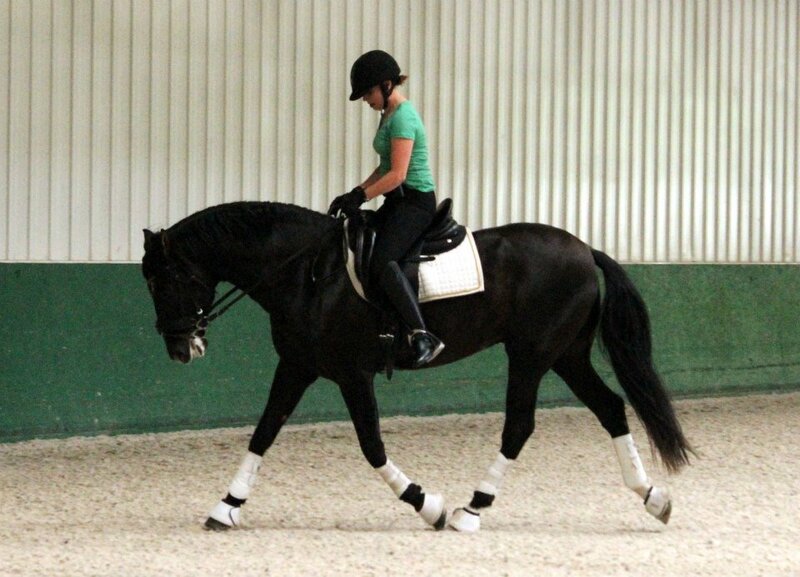 Eventually I would LOVE to get some beginners on him so he figures that out too, I really want him to be like Rico- who will cart around a 4 year old in his western jog and who also lets my more advanced friends/students learn how to ride tempi changes and pi/pa too. I wish I had a horse that I could put beginners on. Neither of mine are ready for that. If I had one of those gems that you can put anyone on, I would be somewhat choosy and if someone didn't listen or proved themselves unworthy I wouldn't hesitate to revoke their rights. Now that I have my horses at my own place, I really miss having other people to ride with. And I wouldn't mind having someone else to help me keep the two horses ridden (leaving me time to also work on the mule's driving lessons). I do have an adult neighbor (in her 20s) who is quite horsey and has taken lessons. I floated the idea that if she was willing to take lessons with my dressage instructor, she could ride one of my guys. I immediately had second thoughts, because the horse that I'd trust to have her on, was going through a delicate time and I didn't want to confuse him. She hasn't taken me up on it though and in the meantime, that horse is settling back down and would probably be okay with someone else. It can be hard to stay motivated to ride by yourself at home! That's half the reason I like to board one out -- the other half being the indoor arena, lol. 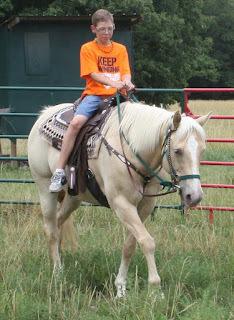 It can definitely be scary letting somebody else ride your horses. I let pretty much anyone over 18 ride my horses. In fact, I just did a blog post today about letting my friend who has only ridden about 12 times in her life do two classes at a schooling show last weekend. Under 18s are not allowed to ride any of our horses even if they're very good riders or the horse is very well behaved. In CA, it's just not worth the liability. And that's so neat about your friend getting to show,ill have to go read that post! It's easier to block acquaintances who want to ride my own mare with "she's in training". My boys' pony gets sticky. Obviously he's kid safe. Obviously I have tiny tack/helmets. However, I don't feedt he pony, clean stall his stall, pay the vet, haul hay just to have him for others to ride. I'm selfish & want my kids to enjoy their pony. I pass the blame onto my insurance policy that will only allow family members.